Noshok® series 29 mini diaphragm seals are off-line seals with a threaded connection and an all welded, all metallic housing design that doesn’t use an O-ring or gasket. They can be uesd for remote mounting of pressure instruments with capillary. They are commonly used for water & wasterwater, oil & gas, petrochemical, chemical processing, industrial automation, marine, agriculture, mud pumping, pulp & paper, pneumatic, and steel fabrication. 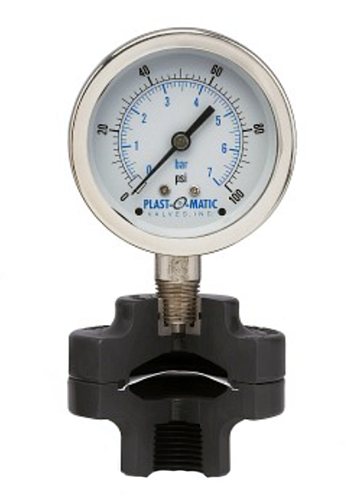 Noshok® series 10 and 10H large diaphragm seals are designed to isolate the pressure measuring instrument from high temperatures, corrosive, or viscous process media. They are commonly used for water & wastewater, oil & gas, petrochemical, chemical processing, industrial automation, marine, agriculture, steel fabrication, mud pumping, pulp & paper, and pneumatic applications. Ashcroft® series 500 and 501 large diaphragm seals are small enough to be used in compact spaces, but provide sufficient displacement to drive a wide variety of instrumentation. Their all-welded construction prevents possible process media leakage where fugitive emissions are a concern. They are commonly used for corrosive processes, processes with elevated temperatures, viscous process media, limited space, water treatment facilities, and where male connections are preferred.